In this research review released by Western Sydney University’s Hawkesbury Institute for the Environment and its international research team, scientists are using advanced technologies such as Magnetic Resonance Imaging (MRI ) to peer into living trees and map how increasing dehydration of the trees results in the progressive dieback of leaves and branches, eventually causing the trees to be unable to move water through the stems. As the trees weaken, they become susceptible to insect and disease attacks which ultimately can kill the tree outright. “Access to imaging facilities such as the Australian Synchrotron are essential for conserving our environments and play a crucial role in ensuring we are ahead of a rapidly changing world climate”. 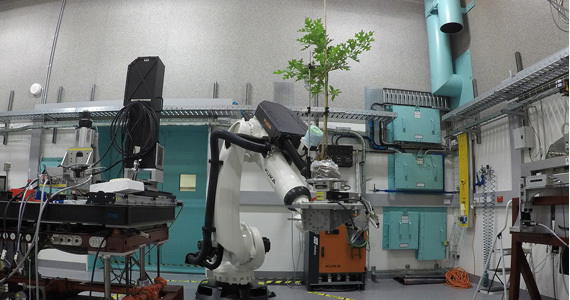 “Using our imaging and medical beamline for this study demonstrates the capacity of this instrument to provide deep, detailed information on how trees transport water and nutrients from roots to leaves. The IMBL is used to 3D image a wide range of samples from fossils to industrial materials to human tissue, but in this instance, we were providing insights into the impact of dehydration on plant physiology ” said Principal Instrument Scientist Dr Daniel Hausermann. “Climatic changes are expected to increase the frequency and intensity of droughts and the combination of heat and dry really stresses even the hardiest trees”, explains Associate Professor Brendan Choat, lead author on the review. “If we can work out, using non-invasive methods like MRIs, the point at which trees become too dehydrated to survive then we can establish a dataset that can be used in the field to tell if a tree is reaching the point of no return”, he explains. Trees are only able to move water to the tops of their branches if there is enough water in the soil and if they can preserve the column of water in their stems without bubbles or breakages. Most trees are able to maintain this flow of water but extreme demand for water during heat coupled with increasing soil dryness can mean that the flow can be interrupted. This can result in the death of leaves, then branches and ultimately the whole tree. “Knowing the limits of individual tree species puts us in a good position to understand how vulnerable trees are to death”, says Assoc Prof Choat.